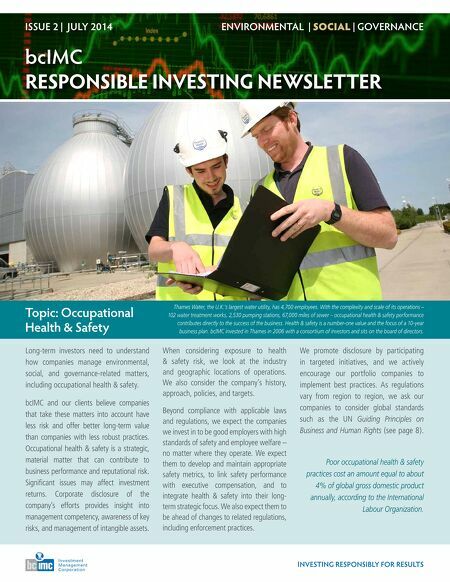 bcIMC RESPONSIBLE INVESTING NEWSLETTER ISSUE 2 | JULY 2014 ENVIRONMENTAL | SOCIAL | GOVERNANCE INVESTING RESPONSIBLY FOR RESULTS Long-term investors need to understand how companies manage environmental, social, and governance-related matters, including occupational health & safety. bcIMC and our clients believe companies that take these matters into account have less risk and offer better long-term value than companies with less robust practices. Occupational health & safety is a strategic, material matter that can contribute to business performance and reputational risk. Significant issues may affect investment returns. Corporate disclosure of the company's efforts provides insight into management competency, awareness of key risks, and management of intangible assets. When considering exposure to health & safety risk, we look at the industry and geographic locations of operations. We also consider the company's history, approach, policies, and targets. Beyond compliance with applicable laws and regulations, we expect the companies we invest in to be good employers with high standards of safety and employee welfare – no matter where they operate. We expect them to develop and maintain appropriate safety metrics, to link safety performance with executive compensation, and to integrate health & safety into their long- term strategic focus. We also expect them to be ahead of changes to related regulations, including enforcement practices. We promote disclosure by participating in targeted initiatives, and we actively encourage our portfolio companies to implement best practices. As regulations vary from region to region, we ask our companies to consider global standards such as the UN Guiding Principles on Business and Human Rights (see page 8). Poor occupational health & safety practices cost an amount equal to about 4% of global gross domestic product annually, according to the International Labour Organization. Topic: Occupational Health & Safety Thames Water, the U.K.'s largest water utility, has 4,700 employees. With the complexity and scale of its operations – 102 water treatment works, 2,530 pumping stations, 67,000 miles of sewer – occupational health & safety performance contributes directly to the success of the business. Health & safety is a number-one value and the focus of a 10-year business plan. bcIMC invested in Thames in 2006 with a consortium of investors and sits on the board of directors.